The day after Christmas is a national holiday in Australia known as Boxing Day. 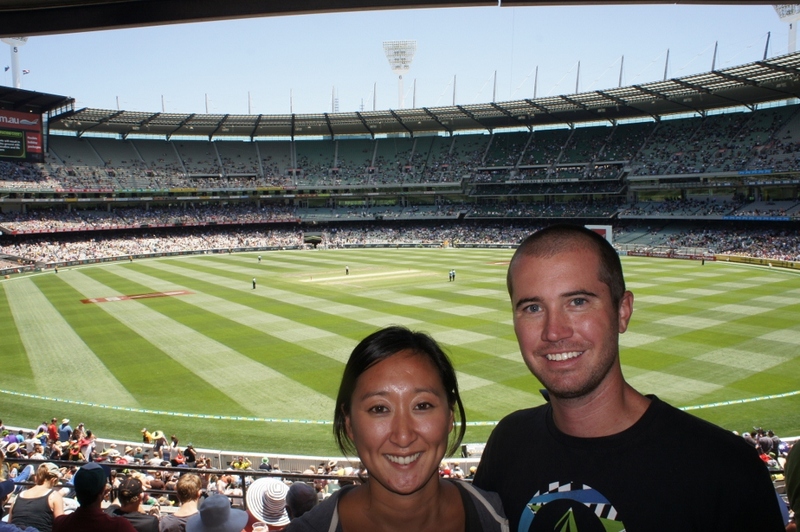 Months ago, the Jays emailed us about attending the annual Boxing Day Test Match, the most prestigious day in the year to watch a cricket match. They say one of the ways to fully immerse yourself in a place is to attend a local sporting event. So that is exactly what we did. 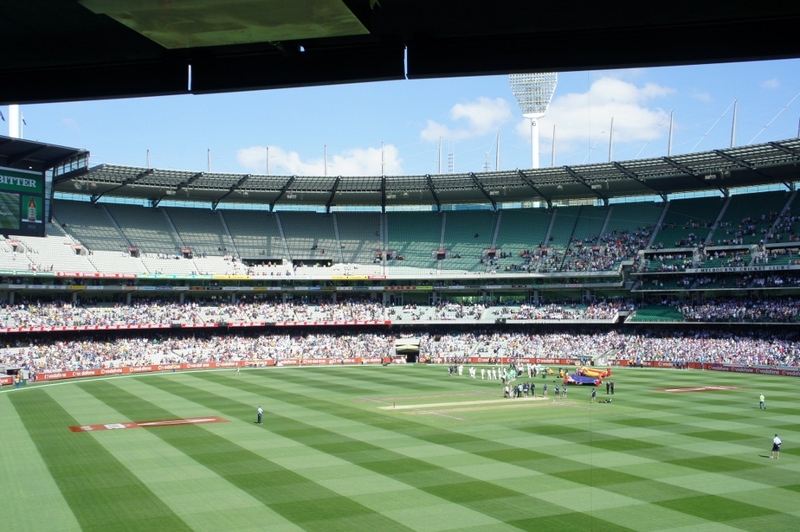 Cricket test matches can last up to five consecutive days and even after all that playing time, the game can still result in a tie or draw (two different things in cricket). It’s a 360 degree playing field and the stadium is a giant circle instead of a diamond so batsman can hit the ball wherever they want, including behind them. Bowlers (pitchers) can run for as long as they want before they bowl (pitch), usually up to 30-35 yards. The ball is hit and thrown just as hard as a baseball but the fielders don’t wear any gloves…ouch! The game we attended started at 10AM and lasted until 6PM with multiple breaks for lunch and tea time. In a test match, both teams wear all white with white sweater vests over short-sleeved white collar shirts…very proper looking! 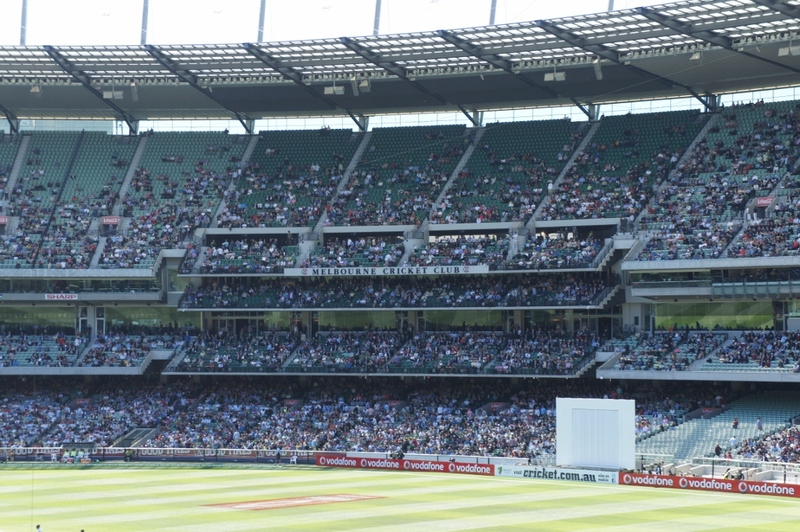 Although it wasn’t as crazy and intense as attending a football game in Argentina, the Boxing Day Test Match is a spectacle. Even if you aren’t into cricket, you can still enjoy the experience. Just sit in the sun and people watch while you enjoy a cold beer and a hot meat pie. Australia ended up beating Sri Lanka on the third day 460 to 259. Go Aussies! 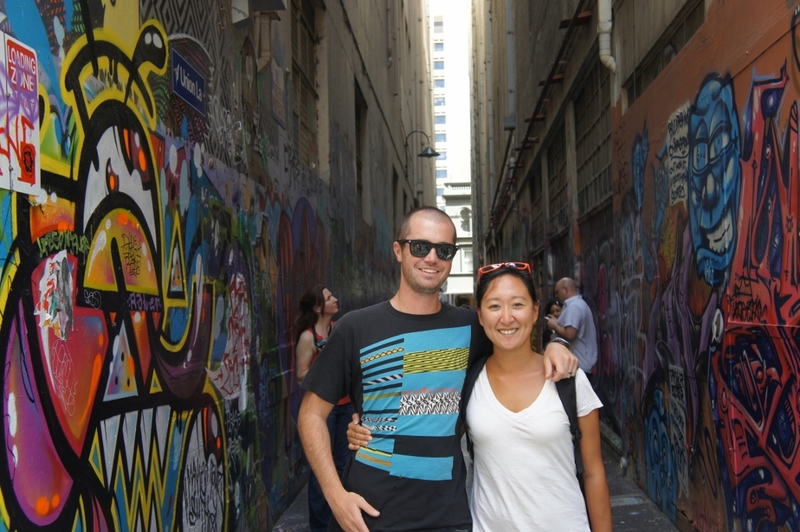 For three weeks we’ve been living in Melbourne but have not been downtown to explore the city. We finally made a point to go check it out and even made arrangements to rendezvous with a friend from our Africa trip who lives outside of the city. 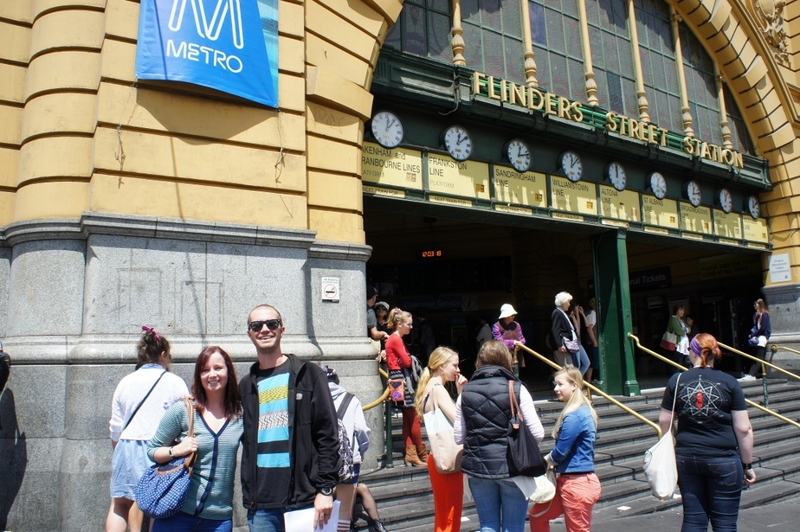 We met our friend Kedda under the clocks at Flinders Street Station, a very Melbourne-thing to do, had lunch in Chinatown and browsed through food and souvenir stalls in Queen Victoria’s market. 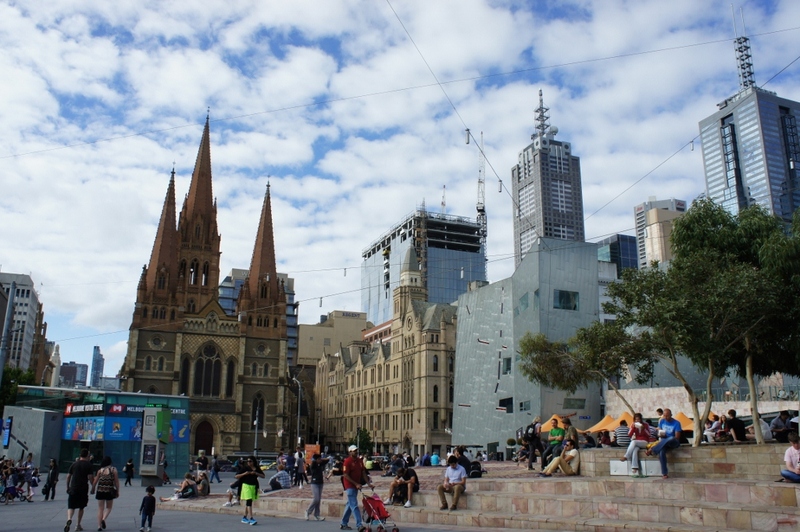 Melbourne is known for their arcades (shopping districts) and alleyways leading to boutiques, restaurants, shops and bars. We meandered down a few of the arcades, visited a few rooftop bars, saw the famous portrait of “Chloe” at the Young and Jackson hotel and finally said goodbye to Kedda before returning home. The weather was beautiful and we enjoyed (finally) our up close and personal encounter with the city. 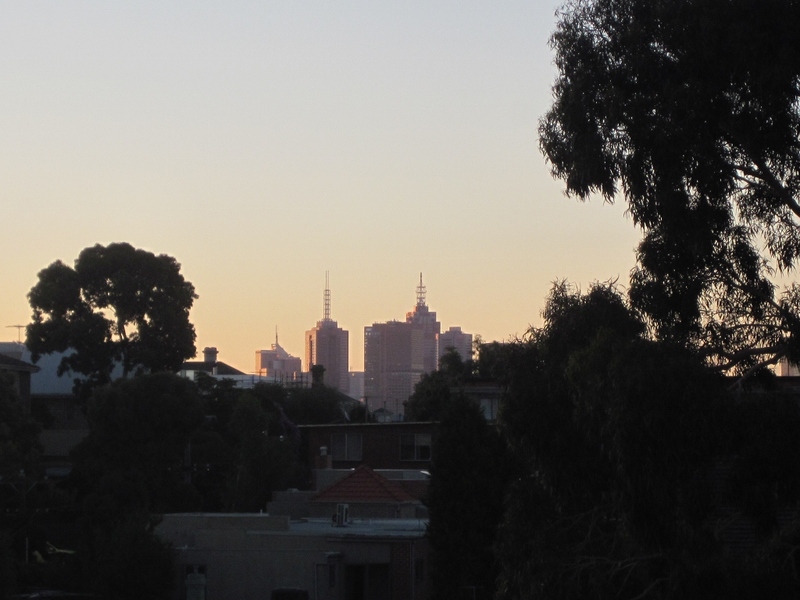 New Year’s Eve provided the perfect opportunity to take in Melbourne’s city skyline. Phil and Belle Jay invited friends over to celebrate 2013 on their rooftop deck. 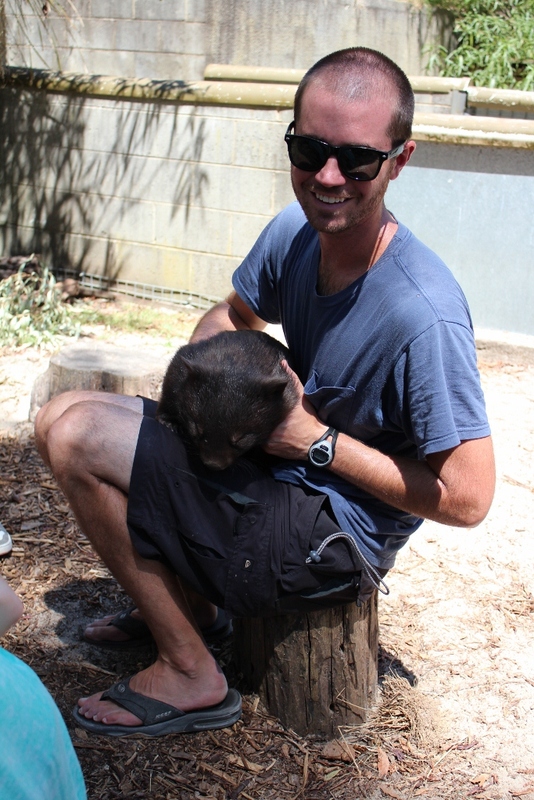 During the day, there were a few little Aussies around for us to play with. 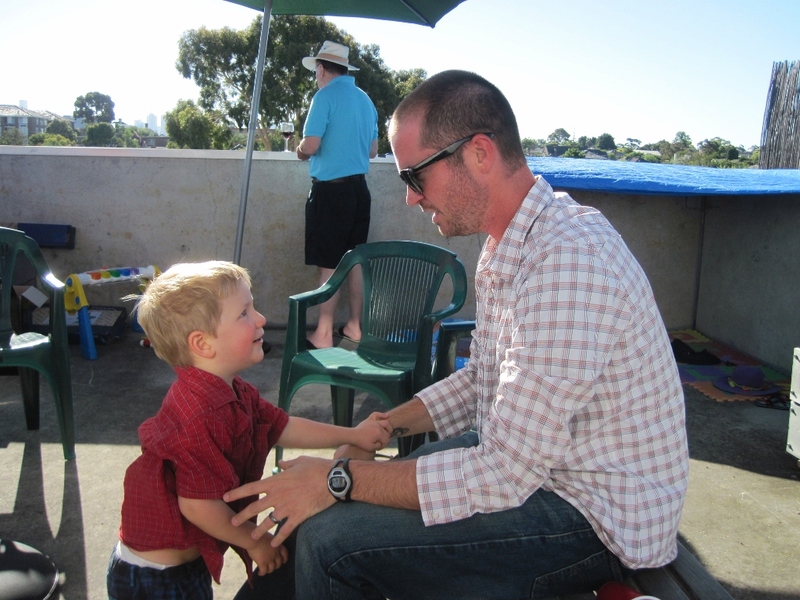 We all know how much Chris loves kids! 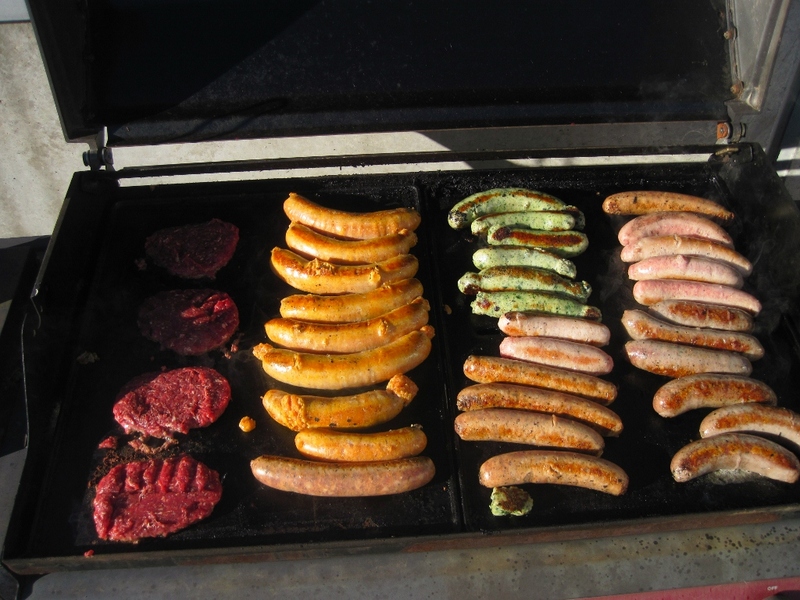 As Aussies do, we had a smorgasbord of sausages (they call them ‘snags’) and kangaroo burgers. Who knew sausages could be so darn colorful? 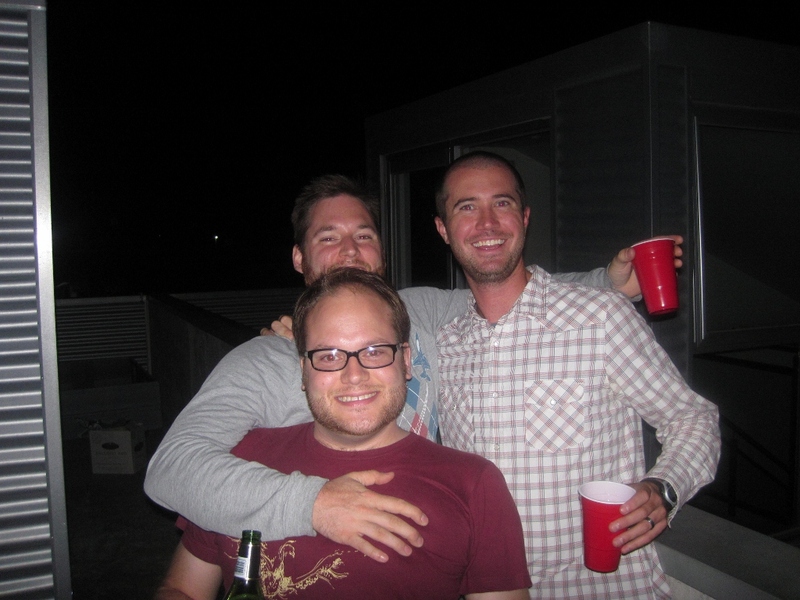 We rang in the New Year with pretty much everyone we’ve gotten to know in Melbourne. We had a good laugh at the photo taken below because we look so stoic, almost like we are taking a class picture in first grade all lined up in a row. It’s so nice to celebrate New Year’s Eve in the summertime with a barbie under big sun umbrellas wearing flippy floppies and shorts. Those Aussies are on to something! As if we didn’t clock enough hours of cricket during the Boxing Day test match, we decided to go to a much faster-paced 20/20 match. 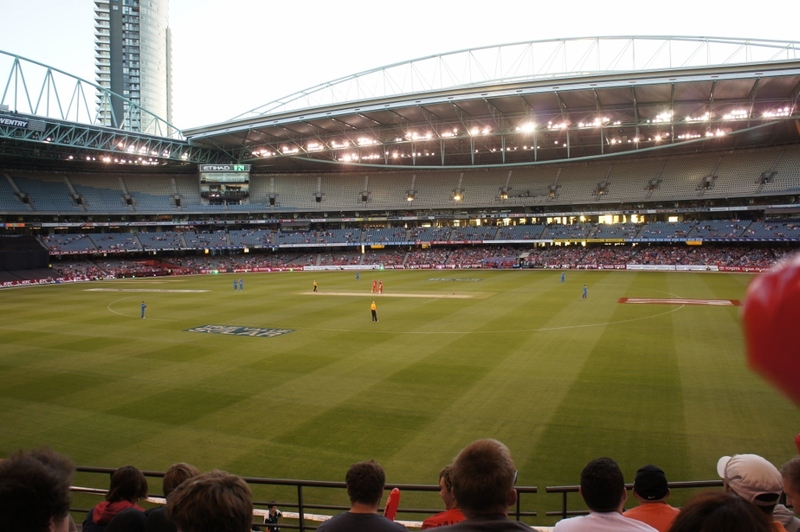 Nicknamed “the big bash league,” these matches typically last around three hours so the batsmen are much less conservative and tend to swing for the fences. The experience is similar to an NBA game in the States with flashing lights, smoke machines, cheerleaders, etc. It’s much more action-packed and a very different atmosphere than the conservative test cricket matches. 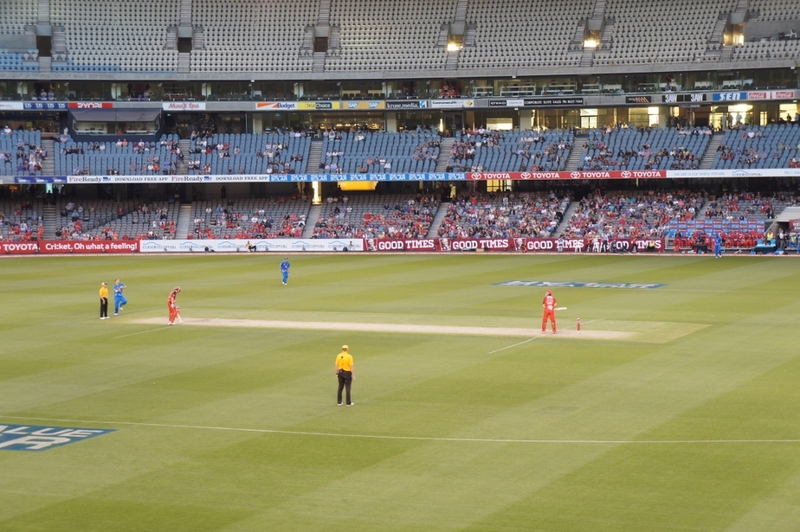 The Melbourne Renegades beat out the Adelaide Strikers 155-107. Woohoo! Sometimes when we aren’t playing tennis or swimming in the salt water pool at the Jays, we find ourselves having a hit with the cricket bats. It’s much harder to hit than a baseball and the pitchers (bowlers) are allowed to hit you on purpose! 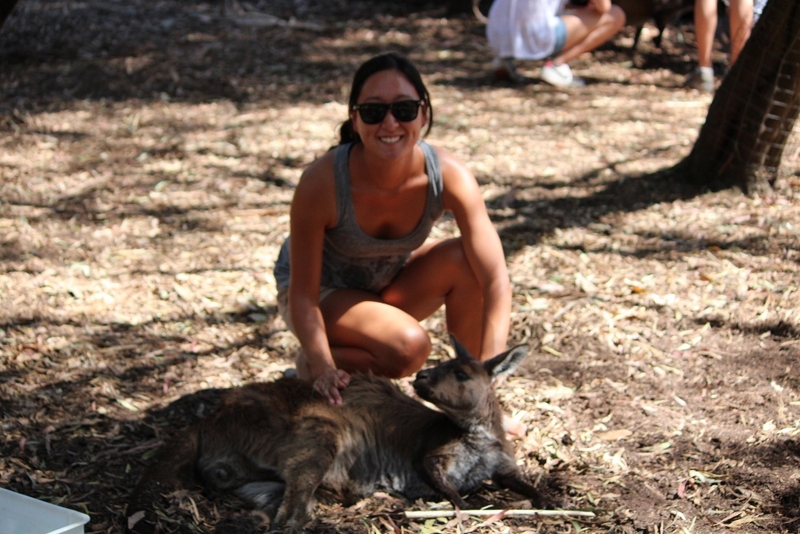 Can you believe that in our entire time in Australia, we haven’t seen a kangaroo? Well, I take that back. 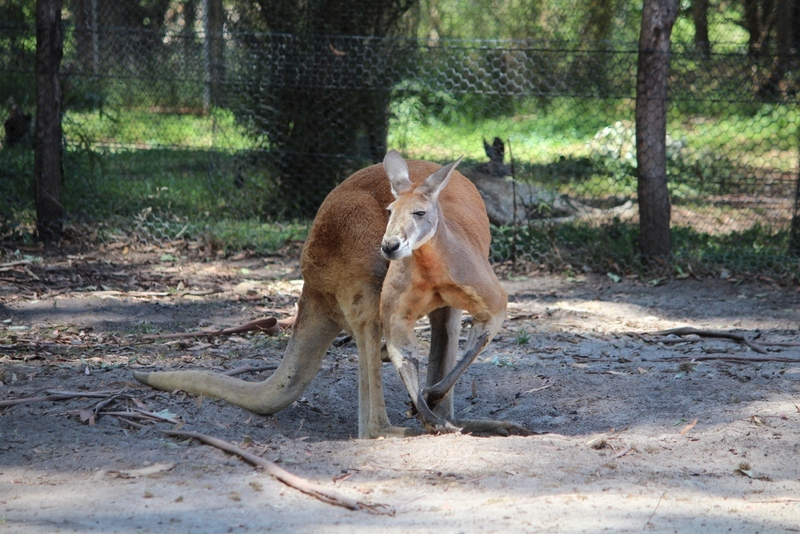 We saw a few from a distance but wouldn’t have known they were roos unless someone told us. We also saw two dead along the road, but that doesn’t count. 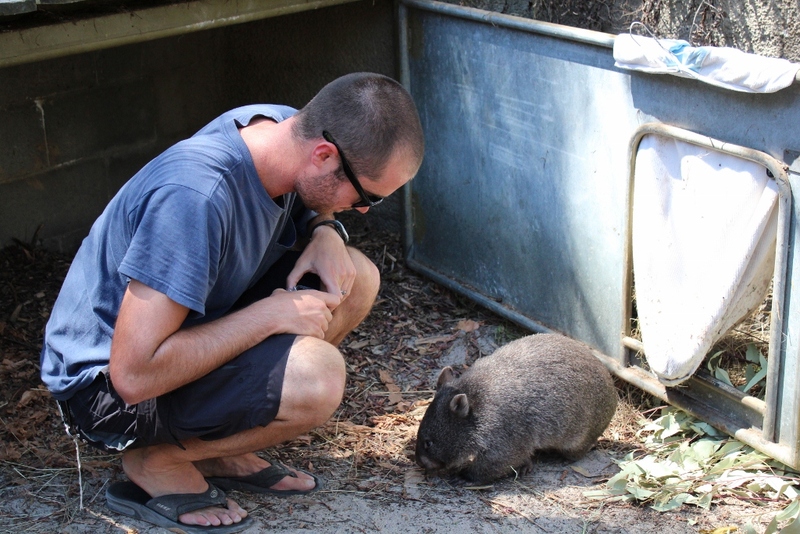 To ensure we had a legit look at Australian animals, we took a day trip to the Healesville Sanctuary. 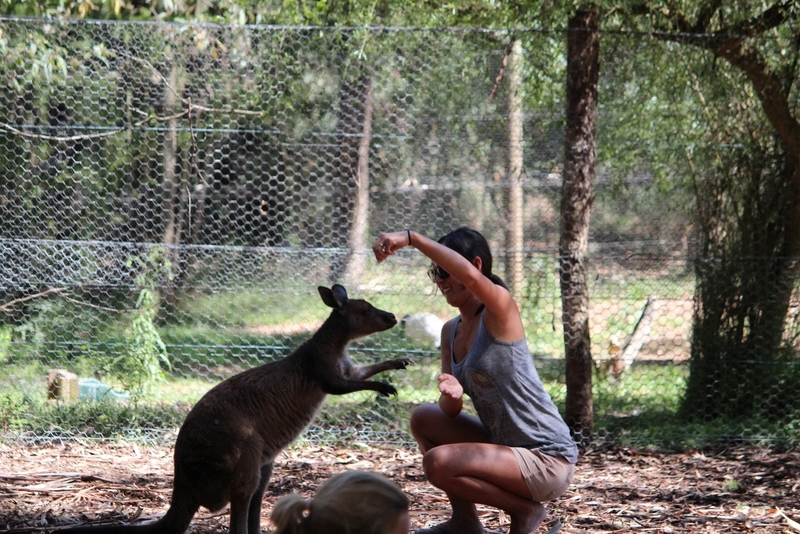 The sanctuary has a plethora of Australian animals that we laid eyes on for the first time…kangaroos, emus, wombats, echidnas, wallabies, dingos, platypus, Tasmanian devils and bandicoots. 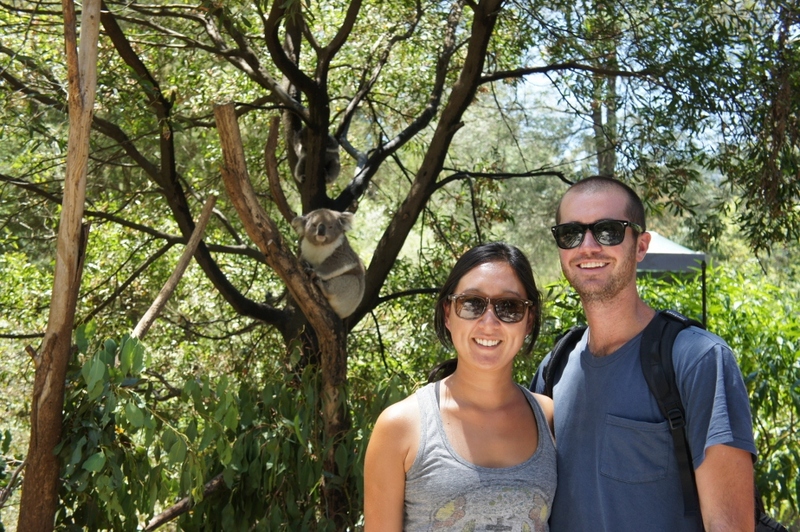 And of course, we went to see the koalas three times before leaving. 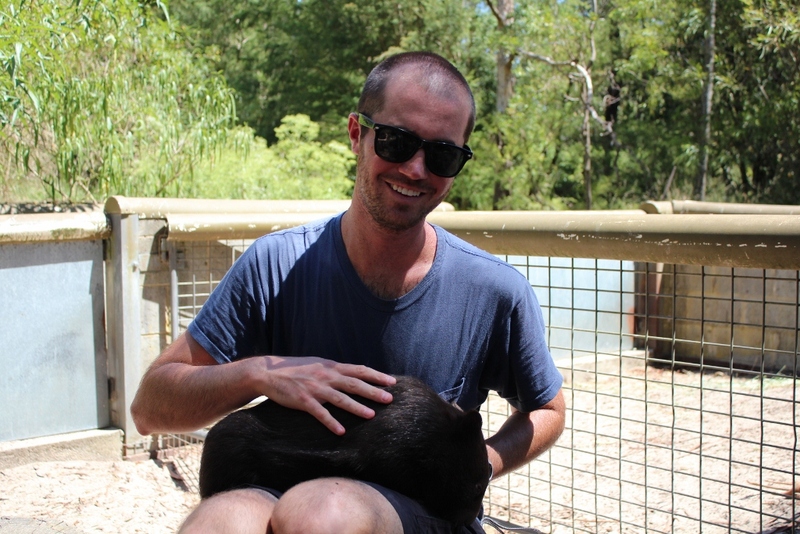 To my disappointment, you can’t touch or hold koalas in the state of Victoria. 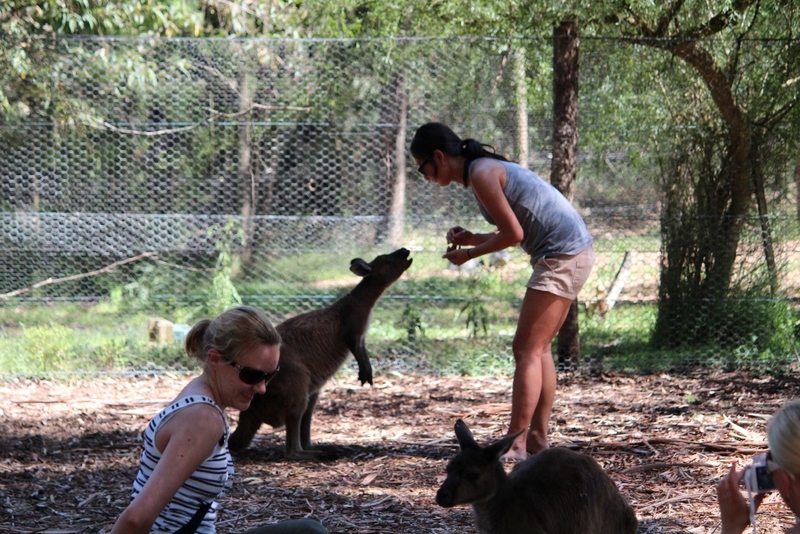 So instead, I fed the kangaroos while Chris held a wombat! We won’t do a formal recap of our time in OZ. Instead, the past month (34 days to be exact) can be summed up as a much welcomed break from the constant traveling we’ve done the first five months. We’ve been staying at (our home away from) home. We slept in a proper bed, could drive to the grocery store, took the train into the city, sat down to enjoy a few beers at the pub, had home-cooked meals and had access to laundry machines whenever we wanted. We’ve been spoiled! 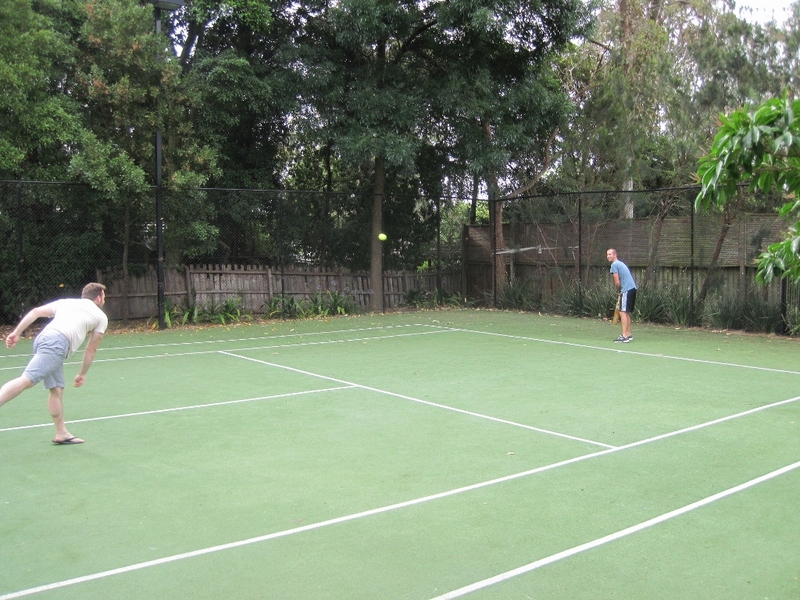 We’ve also been working hard on our tennis game, have eaten more sausages this past month than in one year in the States, have a new-found appreciation for the game of cricket and have thoroughly explored the state of Victoria. We were so lucky to stay with the Jays. They are truly wonderful people who opened their home(s) to us. 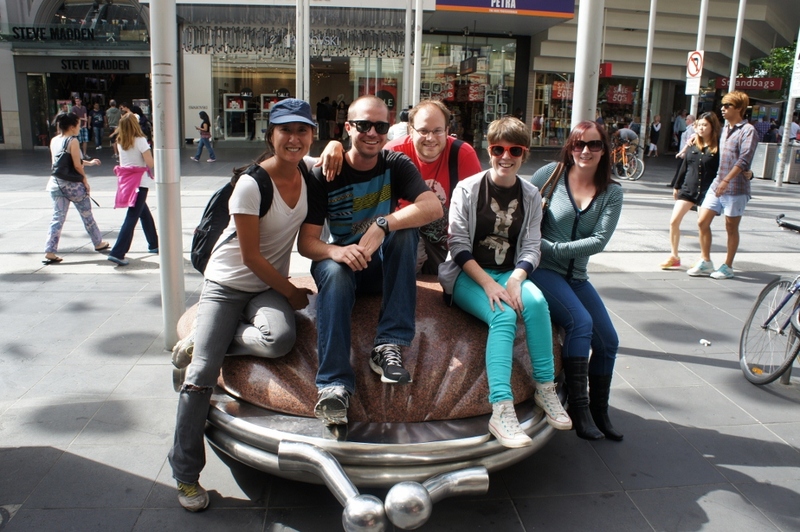 Thanks for making our time in Australia incredibly memorable and comfortable. We will miss you all! We leave for New Zealand excited but also with a bit of anxiety. It’s been nearly three months since we’ve traveled on our own! However, if the next six months are as amazing as the first six, we are in for a treat. Thirty minutes from Melbourne is the Yarra Valley, the city’s own wine region which is chock-a-block with wineries, breweries, flash restaurants and eateries. We were impressed with Chris Jay’s jam packed itinerary to hit up six wineries, two breweries and one sparkling winery in just one afternoon. The wine, cider and beer were all delicious and we even tried something new – sparkling red wine from Chandon. What really stole the show was the beautiful landscape. I can’t believe I’m saying this, but I may be convinced the Yarra Valley beats out Napa/Sonoma for the best scenery. After lunch and a few games of bocce ball, we retired back home for another amazing dinner cooked by Mr. Jay. The next day, we planned and prepped for a three-day road trip. The plan was to drive along the southern coast of Victoria on Great Ocean Road, then head north to Grampians National Park before returning to Melbourne. We packed all of our camping gear and were off the next morning on our mini adventure…driving on the left side of the road in the Jay’s borrowed car. Driving Great Ocean Road is similar to driving the Pacific Coast Highway in California. The road hugs the coastline as you pass beautiful beaches, impressive cliffs and parks. It’s incredibly beautiful. I am prone to falling asleep in the car, so when I was taking a quick doze Chris pulled into Cape Otway for a surprise detour. 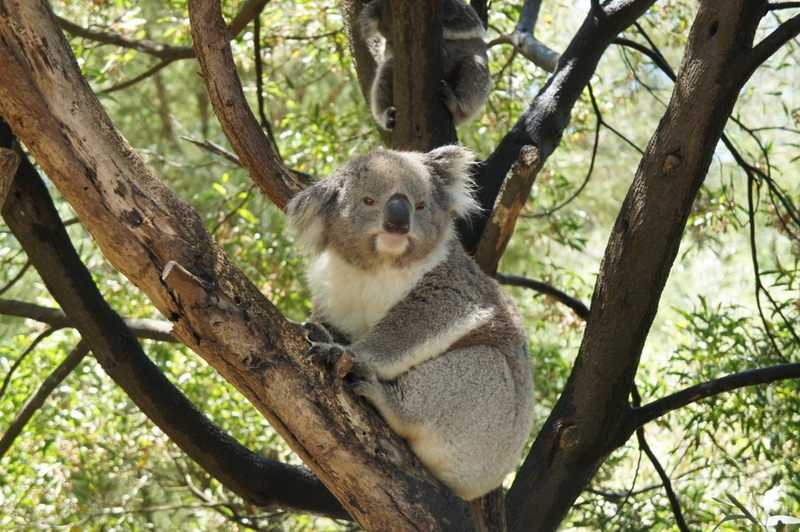 When I awoke, I looked out the window to see heaps of koala bears sitting in the gum trees! For those of you who don’t know, bears are my favorite animals and although koalas aren’t technically bears, they are close enough! They were so cute sitting on the tree branches! They would hold on to the limbs with their claws so they wouldn’t fall off while they slept. Adorable! One of the main attractions on Great Ocean Road is the Twelve Apostles. The apostles are limestone rock stacks formed by the erosion of the coastline. Despite the name, there are only nine apostles and they continue to shrink and crumble as the ocean tides erode them away. In addition to the well known Twelve Apostles, there are several other natural limestone rock formations along the coast including Loch Ard Gorge and London Arch. There are so many nice lookouts, beaches, bays and towns to stop along the way. The drive itself takes approximately three hours but we spent nearly 12 hours so we could take it all in and enjoy the views. I should mention that this day was also my birthday. I couldn’t think of a better way to celebrate than with a road trip across a beautiful coastline! We finally arrived at our holiday park (campground with the works) to pitch our tent for the night. Our campsite came with it’s own bathroom and shower…very fancy. Every year for my birthday, Chris takes me wherever I want for dinner. I usually choose White Castle because Chris hates Whities and so I rarely get to eat there. Given that there isn’t a White Castle in Australia, I chose the next best thing…a foot long turkey sub from Subway. Yumm-o! And that my friends is a happy camper! The next afternoon, we starting driving north to Grampians National Park. Once we reached the park, we had lunch and made our way to a few scenic overlooks. The overcast skies scared us into making camp for the evening. The next morning, we packed up camp and headed out to view some nearby waterfalls before driving back to Melbourne. We had one day to do laundry and rest before we were off again. 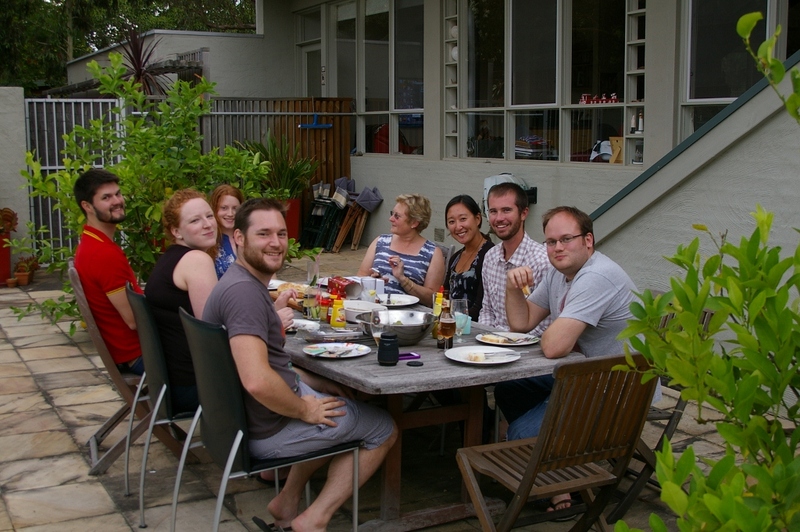 This time, our destination was to the Jay’s beach house in Cape Schanck for the weekend. Cape Schanck is located just south of Melbourne on the Mornington Peninsula and is a mecca for wineries, cheeseries, fruit orchards and beaches. We had delicious barbies, played on the beach and enjoyed the sunset each night. Our last morning was spent fishing off the local pier. It was fun fishing with different types of bait (squid and clams) and trying to catch different species of fish found in Australia. We witnessed a fellow fisherman catch a huge squid that was blowing gallons of ink all over the place which was quite entertaining. We only caught two small wrasse that we had to throw back but we still had a great time. Chris loves to fish and he had fun just being outside on the ocean holding his fishing rod. We arrived back in Melbourne on Christmas eve afternoon, which is when the Jays celebrates Xmas, just in time for a pool-side barbie. Lunch was followed by a huge game of tennis, a massive feast of tiger prawns, turkey, ham and of course, the opening of presents. We must have been good this year because Santa still found us all the way in Australia. I originally thought that we would be homesick this time of year because of the holidays. Surprisingly, we haven’t and I suspect it’s because of a few factors…(1) it’s summer here in Australia so it’s hard to believe its Christmas time. We’ve been having barbies and eating outside in shorts. This would never happen back home. Christmas in summer is definitely not a bad thing. (2) There are so many people around to keep us company and the Jays have been so gracious and welcoming, how can we feel lonely or sad? 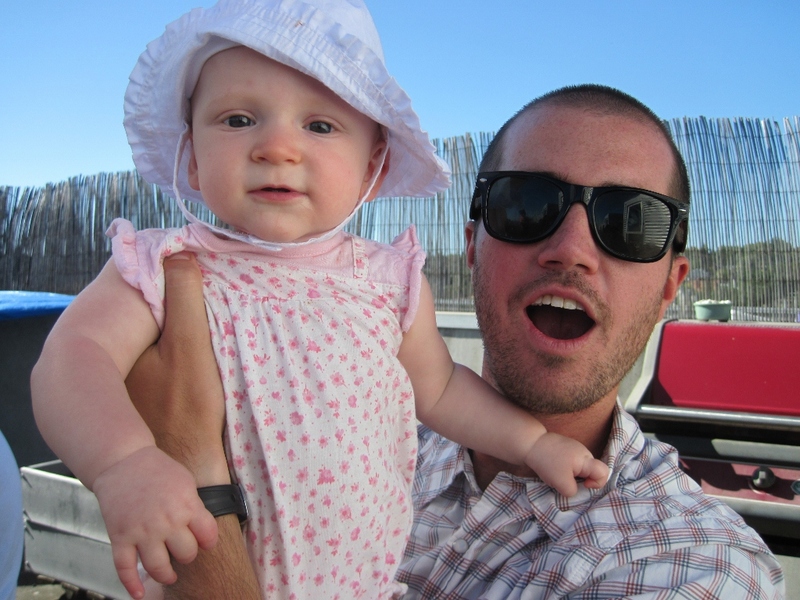 (3) We’ve been so incredibly busy with day trips and weekend trips, we haven’t had time to get homesick. Of course we still miss our friends and family back home immensely, but we find ourselves blessed to be on this journey. We’re lucky to have a family to stay with on the holidays and the opportunity to experience new traditions and a different side of Christmas! Happy holidays to all of our friends, family and fellow travelers. We hope your Christmas was as wonderful as ours. Cheers! Within 40 hours of traveling, we set foot in Africa, the Middle East and Asia before finally arriving in Australia! For the next month, our home base will be the Melbourne area. The Jays are family friends and are gracious enough to let us stay with them while we are in Australia. We are very lucky! Their house is complete with a tennis court (Chris beats me every time), pool table, pool and spa. 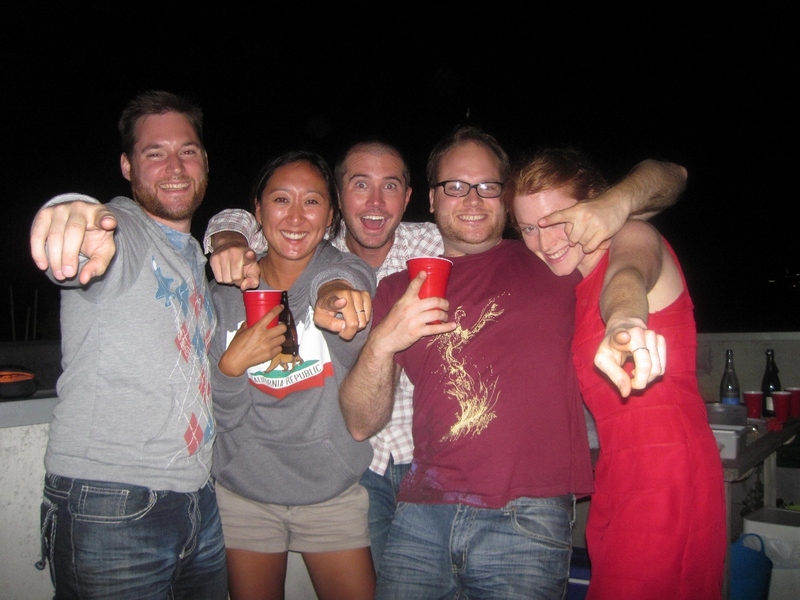 There are three Jay siblings – Meredith 25, Chris 27 and Phil 30 years in age. Two of them live at home and they are all in relationships so there is always someone to hang out with at the house. Every year, the Jay siblings attend a three-day music festival just outside of Melbourne with their friends. When they heard we were going to be in town, they bought us a ticket and planned for us to attend Meredith Music Festival with them. And just like that…after spending two nights in a proper bed, we were back in a tent. The atmosphere of the festival is very laid-back and it was a complete hipster fest. Most of the bands and musicians that play at Meredith Music Festival are from Australia but a few come from across the globe. We only recognized one band name but we were assured from the beginning that it doesn’t matter who plays at the concert, it’s a guaranteed good time. There is one stage and over the course of three days, we saw blues/jazz, rock, metal, hip hop, acoustic, dance and pop bands play. The last night, everyone had gone to bed while Chris and I danced the night away in the middle of a huge electronic/dub-step dance party. So fun! Huts throughout the festival offer free breathalyzer tests because as soon as you pull out of the parking lot, you are going to be tested by the police that you are under the legal limit (0.05 BAC in Australia). Chris and I gave it a go even though we weren’t driving. More than eight hours after drinking and eating brekkie, Chris still managed to blow a .035 – yikes! Speaking of alcohol…we heard that things would be pricey when we came to Australia, but we weren’t expecting the price of alcohol to be SO outrageous! 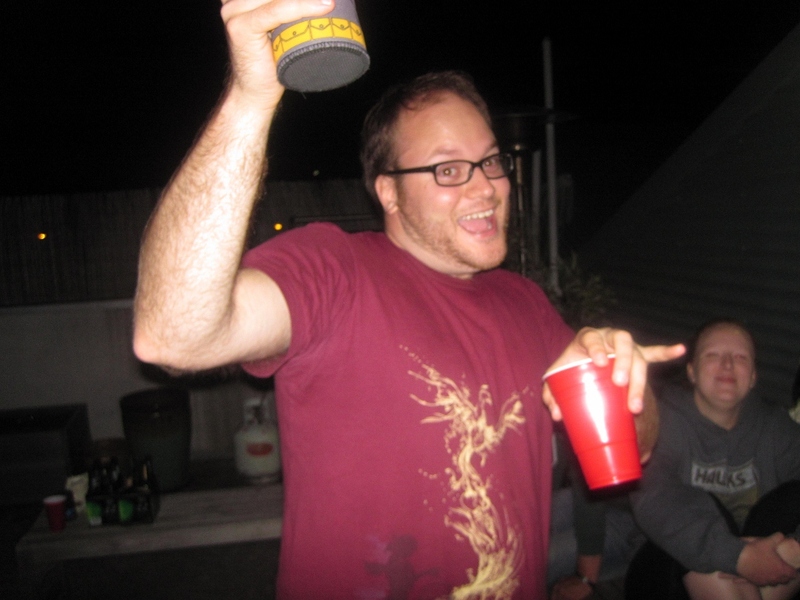 A slab (24 beers) of the cheapest beer costs a whopping $37 on sale but can easily cost around $45. Thinking about mixing your own cocktails? Think again. A 750 ml bottle of Absolut is about $45. One liter of Coca-cola (one liter, not two liters) sells at the grocery store for $4.50. Insane! There are so many great bars in Melbourne, some of the coolest and most unique we’ve seen on our trip. Bummer that cocktails are $16-25 each at just a normal bar! Mr. Jay is a master chef and cooks us delicious homemade dinners almost every night. We arrived back in Melbourne after surviving the three day concert and he was already busy preparing dinner. 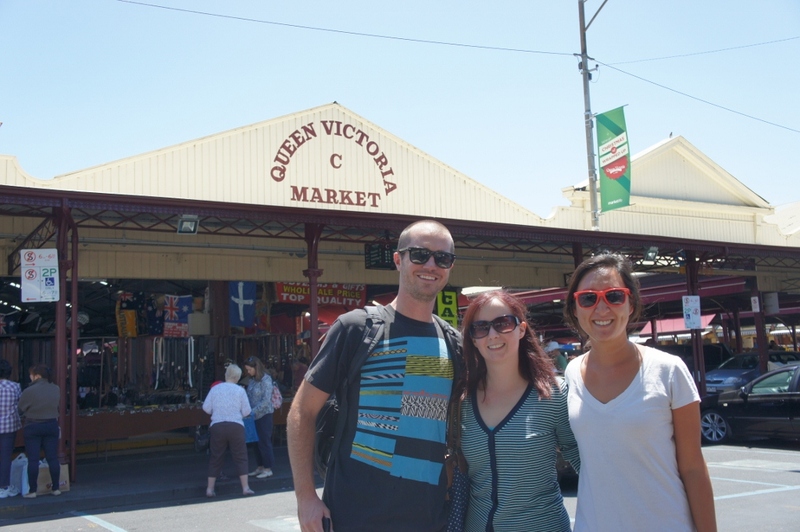 When we first arrived to Melbourne, the Jays wanted to know what we hoped to do while here. Eating kangaroo was on our list, so that evening he made us a lovely kangaroo steak dinner. It was so delicious and is much leaner and better for you than beef. As they would say here in Australia…yumm-o! While we are in Australia, we wanted to find time to head up to Sydney for a few days. With the holidays quickly approaching, we wanted to go sooner rather than later to avoid peak holiday travelers and higher prices. We ended up booking a last minute flight for the middle of the week. Our first day in Sydney was overcast and drizzling. We checked into our hostel and left for a walk down to the harbor. As we began to approach the water, we were thinking the famous Sydney Opera House would be viewable in the distance at any moment. We were surprised as we turned a bend in the sidewalk to realize we were standing right in front of it. It’s so exciting and surreal seeing these iconic buildings in person. We took a walk around the neighboring botanical gardens, museum of contemporary art and the shops and restaurants around the wharf before heading back for the day. 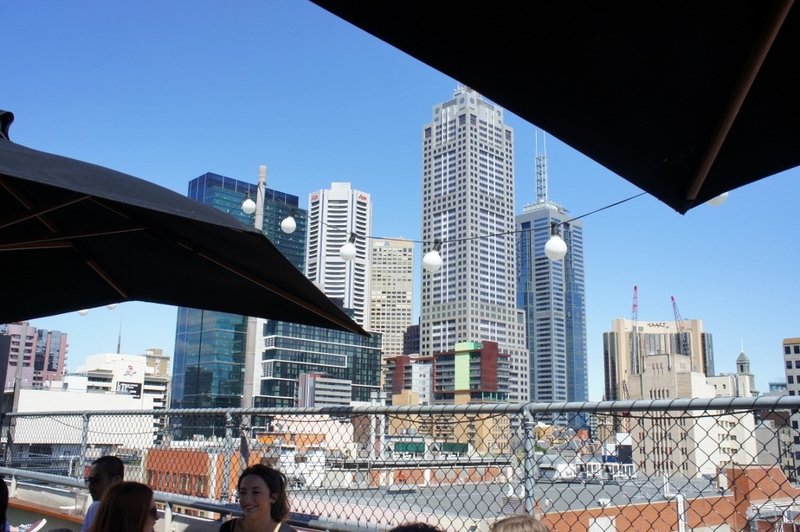 Our hostel had a really nice rooftop terrace with skyline views so we cooked dinner in and had a few drinks before bed. The next morning, we caught a ferry across the harbor to Manly Island. The ferry ride was half the fun as it gave us some great views from the water as we passed the Harbor Bridge and Opera House. We walked through the town of Manly and to the beach to watch the surfers before setting off on a walk around the island. On our last full day in Sydney we walked around The Rocks, Sydney’s oldest and most scenic neighborhood. We found a rooftop bar to enjoy some beer and calamari before our afternoon adventure. The Sydney Harbor Bridge stands 134 meters and was the longest single span bridge in the world until 2009. The bridge is impressive from the ground but as a Christmas present, Mr. and Mrs. Jay gave us tickets to actually climb the bridge. We arrived for our bridge climb and were given a safety briefing, breathalyzer test and all the equipment we would need including a radio, light weight jumpsuit and harness. Personal cameras weren’t allowed to be taken along so most of these photos are from their website (and are much better than what we could have shot anyway). Our guide led us through the undercarriage of the bridge, around the support beams and through catwalks until the start of the main arches. Out of the whole experience, this was the scariest part. The entire bridge would tremble as trams and cars passed overhead. We were walking on see-through metal flooring about three feet wide while heavy traffic zoomed right below us. Once we finally began climbing up the main part of the bridge, we were rewarded with stunning views of the Opera House, Sydney harbor and surrounding areas. It was really interesting to learn about the history of the bridge and how it was built. Climbing on the stairs, walkways and support beams of one of the most famous structures in Australia was such a surreal experience. It was a very memorable day and such a cool way to see the city! 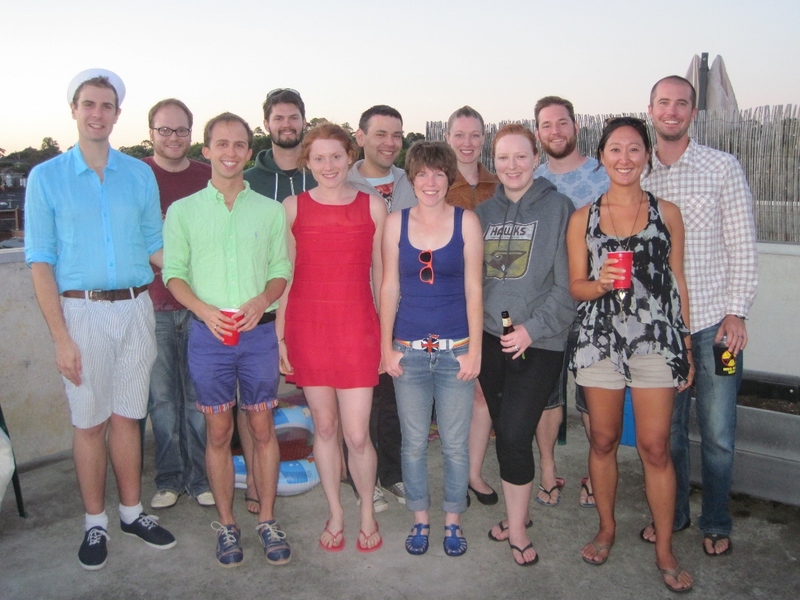 We ended the day with drinks on a rooftop bar in the Kings Cross neighborhood. We caught our flight back to Melbourne midday so we could attend Meredith’s boyfriend’s birthday party at Mountain Goat Brewery. We tried all of the local beers, ciders and several of the homemade pizzas. It was a great way to end a wonderful trip to Sydney! We still have lots on our plate for Melbourne (and the surrounding areas) over the next three weeks including my birthday and of course, celebrating Christmas and New Years! A huge thank you to the entire Jay family, not only for welcoming us into their home but for being extremely generous and accommodating. We are extremely appreciative to Philip, Belle and Matilda Jay for the Meredith Music Festival ticket and to Mr. And Mrs. Jay for the lovely bridge climb Christmas present. We are looking forward to enjoying the next three weeks in OZ!